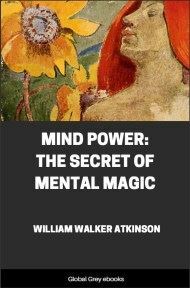 In 1907 there appeared a little book entitled: "The Secret of Mental Magic,” by William Walker Atkinson. 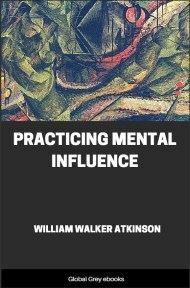 In 1908, the material of said book was edited, revised, and elaborated by the author; portions of its sequel, "Mental Fascination,” combined with it; and a large amount of entirely new material added thereto; the whole being published in new form under the title: "Mind-Power, or The Law of Dynamic Mentation.” In the present edition, the sub-title has been changed to "The Secret of Mental Magic”— thus restoring the original title by which the book is best known to thousands of friendly readers. There exists in Nature a Dynamic Mental Principle—a MIND-POWER—PERVADING ALL SPACE—IMMANENT IN ALL things—manifesting in an infinite variety of forms, DEGREES, AND PHASES. I hold that this energy, or force, or dynamic principle, is no respecter of persons. Its service, like that of the sun and rain, and all natural forces, is open to all—just and unjust; good and bad; high and low; rich and poor. It responds to the proper efforts, no matter by whom exerted, or for what purpose called into effect. But the proper effort must be exerted, consciously or unconsciously, else there will be no operation of the force. I believe that the activities of this dynamic mental principle are intimately correlated to manifestations of the mental operations known to us as desire, will, and imagination. We shall learn something of the laws and principles and modes of operation of its energies and activities, as we proceed with our consideration of it, in this work. It may be difficult for you to grasp this conception of Mind-Power at the start—but it will grow upon your understanding as its activities are presented to you, one by one, like a great panorama. My terms will be explained and illustrated by examples, as we proceed—so you need not analyze them at this point. It may be as well, however, to state that I have used the term "Dynamic” in its original Greek sense, i.e., "powerful”; "possessing power,” etc. 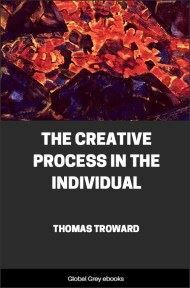 I have postulated of my conception of Mind-Power that it pervades all space—is immanent in all things—and manifests in an infinite variety of forms, degrees, and phases. But, it may be urged, this is nothing more than science claims for the principle of physical energy—then is Mind-Power identical with the physical energy of science?—is it nothing more than a high form of mechanical or material energy? No, Mind-Power is very far from being a blind, mechanical energy—it is a living, mental force, which I hold is behind the manifestations of physical energy and mechanical force. It is not the physical energy of science, but is something of the nature of a living will, which is rather the cause of physical energy, than identical with it. Let us take a familiar example. You desire to move your hand—and it moves. Why? Because of the manifestation of the wonderful and mysterious force called "will” which is stored up within you, and which you have released to move the hand. You send a current of nerve-force which is really a manifestation of Mind-Power or will-force from your brain, along the nerves of the arm, which contracts the muscles of the arm and hand, and your desire is gratified. Your desire, or wish, set into motion the Mind-Power which acted upon the material substance of your body and caused it to act. What was it that flowed along the nerve-wires? Was it electricity, or magnetism? No! it was that subtle and mysterious thing that I am calling Mind-Power, and which is bound up with the will principle of mind. Mind-Power is an actual living force. It is the force that makes plants grow—and animal bodies grow—and which enables all living things to move and act. It is the force which enables the growing mushroom to raise up the slabs of paving stone—or causes the roots of a tree to split open the great boulders, into the crevices of which they have crept. 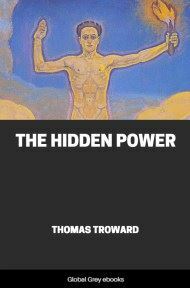 Mind-Power is not an abstraction or speculative nothing—it is an existent, living, mental, acting force, manifesting sometimes with an appalling power, and sometimes with a delicate, subtle touch that is almost imperceptible, but which accomplishes its purpose. In order to reach a clear conception of the universality of Mind-Power, let us consider its manifestations as we see them, unquestioned, in the universe—on the many planes of life and activity. Beginning with the more familiar instances of its operation and manifestation, let us then proceed to delve still deeper until we reach instances not so easily perceived; and then still further back until we find it in places and in things that are generally regarded as lacking in Mind-Power and life. And, here let me say that I hold that life and Mind-Power are always found in company with each other—there is some close relationship between the two—they are probably twin-phases of the same thing, or else twin-manifestations of the same underlying reality. There is no life without mind and Mind-Power—and no Mind-Power, or mind, without life. And, further, I claim that there is nothing without life in the universe—nothing lifeless there, or anywhere. The universe is alive, and has mind and Mind-Power in every part and particle of itself. 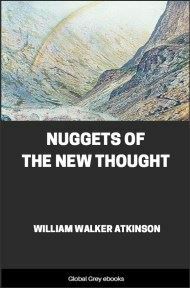 This is not an original idea of my own, of course,— the leading scientific thinkers admit it today, and the Hindu philosophers have known it for fifty centuries. Do you doubt this? Then listen to these authorities who ably express the thought of their scientific schools.